GUYS. I’m obsessed with this ramen. Really the proper thing to say is that I’m simply obsessed with ramen in general. Like, give me any bowl of ramen and I will love it and devour it. I even just wrote an article for Thrillist about the best ramen in Nashville (I think it will be published this week). But this ramen in particular is DELICIOUS and I made it at home by myself which is something that I’ve wanted to do for a while. It’s also completely vegan if you just don’t add the egg on top but I love a good egg with my ramen so I couldn’t resist. Speaking of eggs. I have some terrible news (terrible if you’re me and maybe a little too attached to your pet chickens). One of our chickens was killed on Saturday. Stephen’s convinced it was a small dog which makes sense given the evidence. I was pretty devastated about it and may have had a good cry. I spent ALL day yesterday checking on the chickens every 5 minutes. At one point I heard some loud squawking and ran outside to see several hawks swooping down. Netting to keep the hawks out will be installed ASAP. This morning while I was in the shower I made one of the dogs stay outside in hopes that she would deter anything from coming near the chicken area. At least for the next few days, the chickens are going to have to stay locked up in their 10 foot run area. I feel bad about not letting them free range right now but at the same time, I’m not sure they’d be any happier if the hawks got ahold of them. I have been warned at least 100 times not to get attached to them because this is just how things go when you have chickens. Sigh. I couldn’t not fall in love with them though. Anyways. Back to this Ramen. 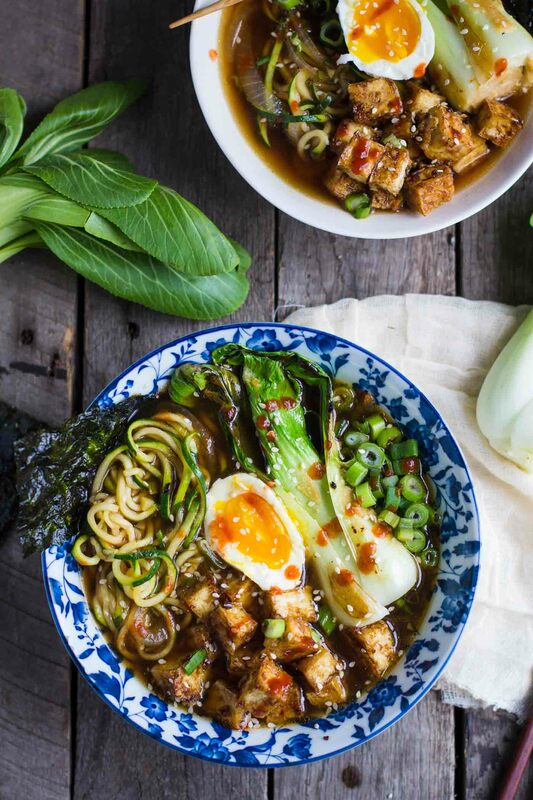 This is actually Zucchini Noodle Ramen Soup. It’s Gluten-free, Vegan (just don’t add the egg), easy to make, and SO delicious. I bought a new spiralizer , the Inspiralizer to be exact, a few weeks ago and have been LOVING it. My old spiralizer broke the first day I used it. I’m in LOVE with this new one. There’s actually nothing too fancy about it which makes it perfect, easy to use, and reliable. 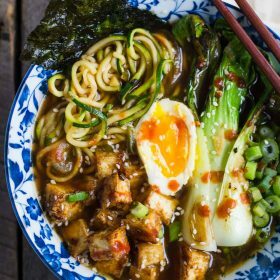 This ramen recipe is actually adapted from Inspiralized’s website (the super cool blogger that created the Inspiralizer). It has 4 different blades to create 4 different types of noodles. I’m kind of obsessed with it and plan to use the HECK out of it. With this new gadget, it takes just about 30 seconds to spiralizer a zucchini and for that, I love it. Actually making the Zucchini Noodle Ramen is pretty easy. Veggies are sautéed and then a stock is added into the skillet to cook for a bit. Towards the end, the zucchini noodles are added in and cooked for just about 5 minutes to make them a bit more tender. Once the noodles are done, they’re added to a bowl. Then the broth is poured over and topped with lots of yummy things such as charred bok choy, crispy tofu, and (if not going vegan) a soft boiled egg. I also sprinkled some sesame seeds over top, added in a bit more of the fresh green onion, and a bit of roasted seaweed. 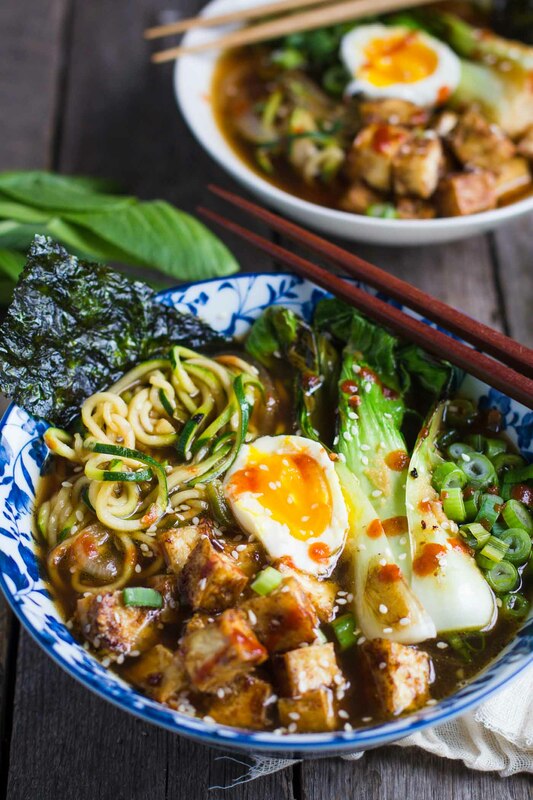 I made 2 bowls of this ramen when I photographed it and ate both of them myself :) Because it’s that yummy! And between the zucchini noodles and the tofu, it’s filling without feeling heavy and healthy while still having some good substance to it. 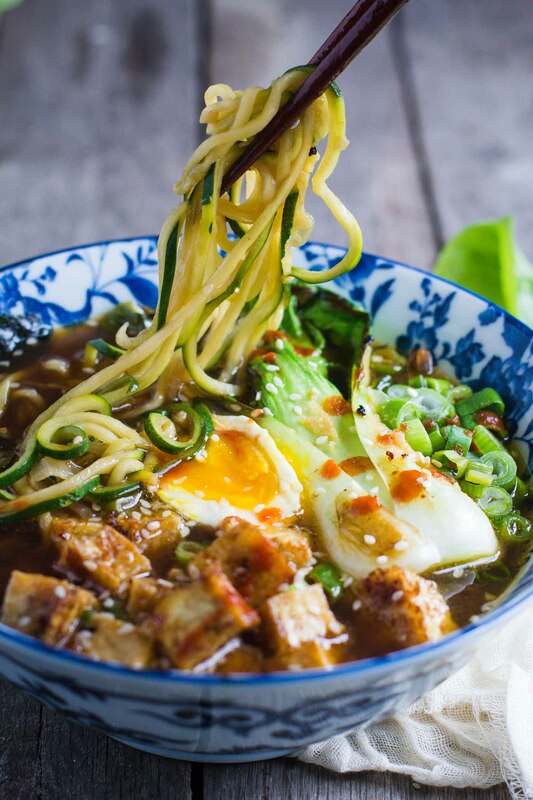 I recommend that you buy yourself an Inspiralizer and make this Zucchini Noodle Ramen Soup ASAP. DO IT! And wish me luck defending my poor hens from all the predators out to get them. Optional for topping: soft boiled egg, hot sauce, extra chopped green onion, sesame seeds, and crispy seaweed. In a large skillet over medium heat, heat HALF of the sesame oil. While the oil heats, rub the bok choy with the meso paste so that the bok choy is evenly coated. Add the bok choy to the skillet and cook for roughly 3 minutes on each side. It’s done once both sides are lightly charred. Remove from the skillet and set aside. To the same skillet, add in the remaining oil, the green onion, ginger, onion, and garlic. Saute for 5 minutes. Add in the stock, cover, and bring to a boil. Once at a boil, lower the heat and simmer for an additional 5 minutes. Add in the zucchini noodles and cook for 2-4 more minutes depending on how tender you want your noodles to be. 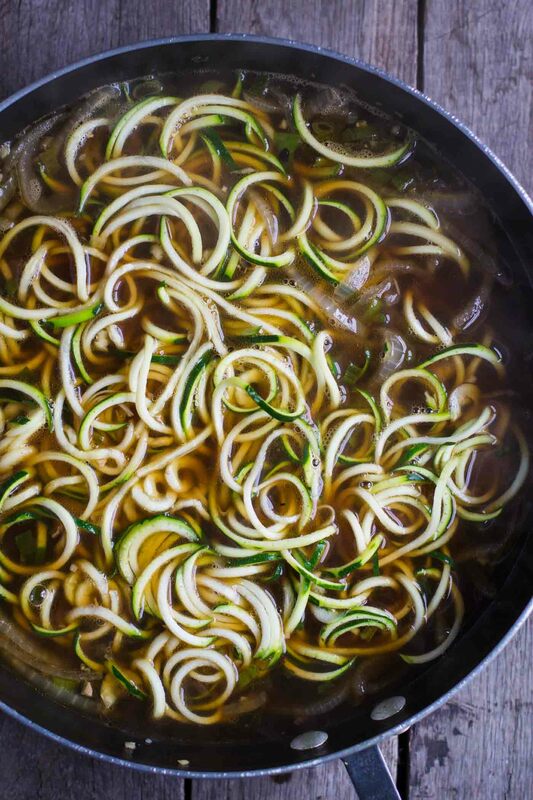 Using tongs or chop sticks, remove the zucchini noodles and evenly place them in 2 large soup bowls. Ladle the broth over top of the noodles and then top with the remaining veggies in the skillet, the bok choy, soft boiled egg (if using), tofu, and other optional toppings. Thank you thank you thank you!! I adore ramen but being diabetic it literally is a killer for me. This is wonderful and I’ll have to try and make it. yay! I’m glad that this is a recipe that can work for you! I love coming up with fun recipes that fit everyone’s needs! I’ve been an email subscriber for some time now and I am always so impressed with you food photography! I bet you can make anything look delicious! This looks SOOO good and I love that you make it with zucchini noodles…. GENIUS!! Aww thanks for coming by and commenting and following along! This really means a lot to me. I’m a bit obsessed with zucchini noodles right now and have been finding some great ways to use them! This looks so delicious! 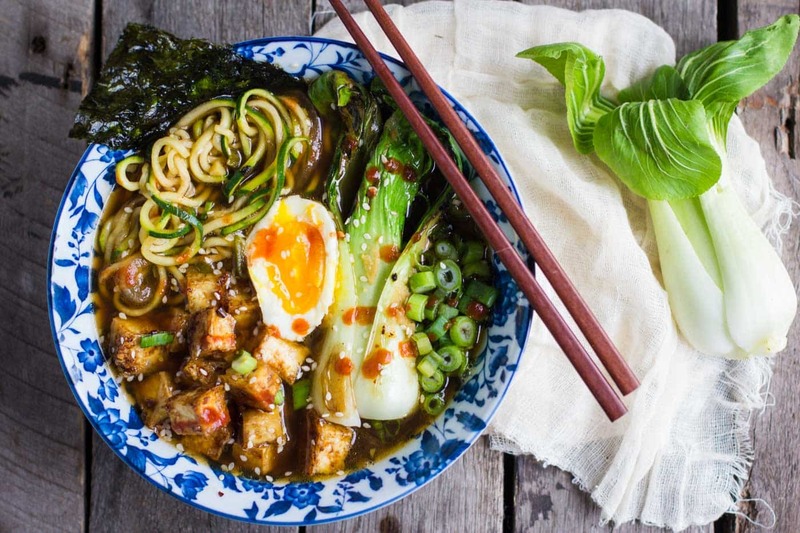 Just pinned it and can’t wait to make it–I never thought of using zucchini noodles in ramen. 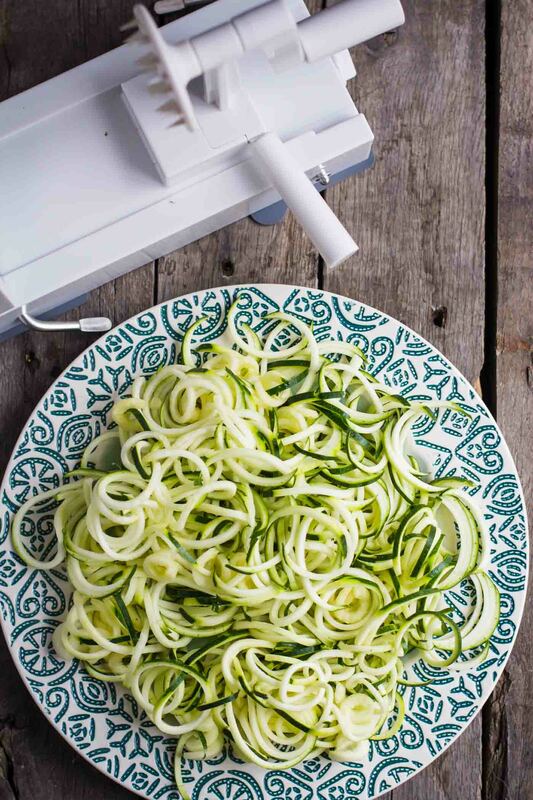 I have a spiralizer, but I’m not a big fan of it because it’s mini, only has one noodle option, and takes much longer than 30 seconds for a zucchini–will have to check out the one you mentioned! Also, excited to see the post in thrillest! YES! My first spiralizer broke the first time I used it. It was still functional but I would have to hold it in a weird way and it took quite a bit longer to spiralizer something. I’m really loving this new one so far!! So sorry to hear about your chicken! 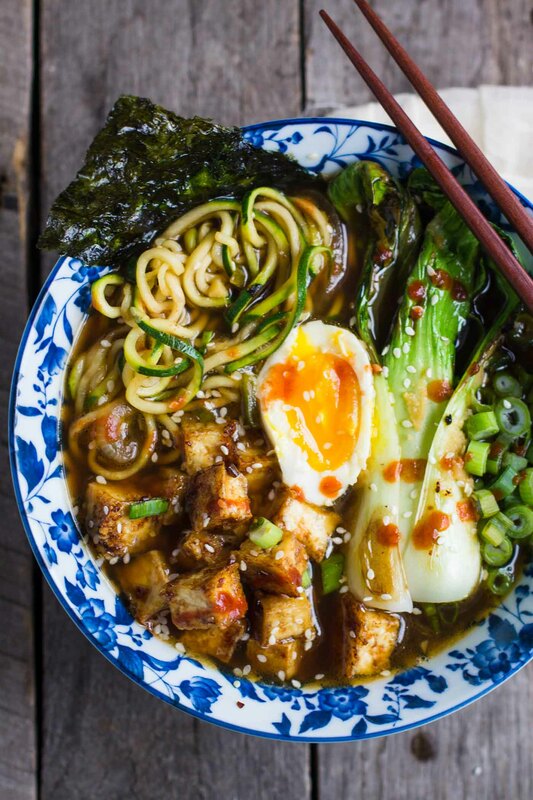 This ramen dish looks delicious. I too cannot resist an egg on top of my ramen! I LOVE that GIF of the zucchini being spiralized!! So mesmerizing! I’m pretty gif’d obsessed. It’s totally worth the half hour I spent taking the photos. haha!! 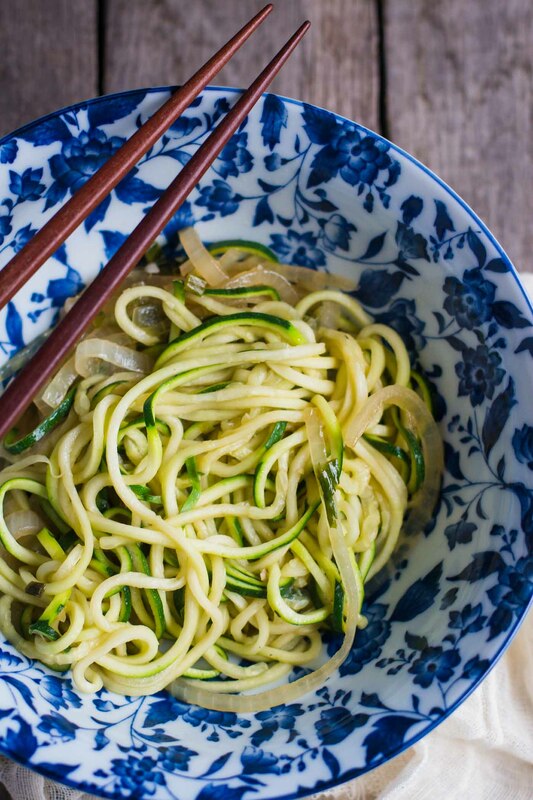 Pingback: Zucchini Noodles: 13 Zoodle Recipes in Under 30 MIN!